Terry “Chino” Chinnery, left, and his sponsors Eileen Parsons and Hon. Myron Walwyn, as he’s presented the certificate by Governor John S. Duncan, after receiving the BVI Badge of Honor for his work in Softball. Terry “Chino” Chinnery, who was recently elected president of the British Virgin Islands Softball Association, was on Thursdayawarded the BVI Badge of Honor, for his work in softball and baseball development since he returned to the territory in 1997. 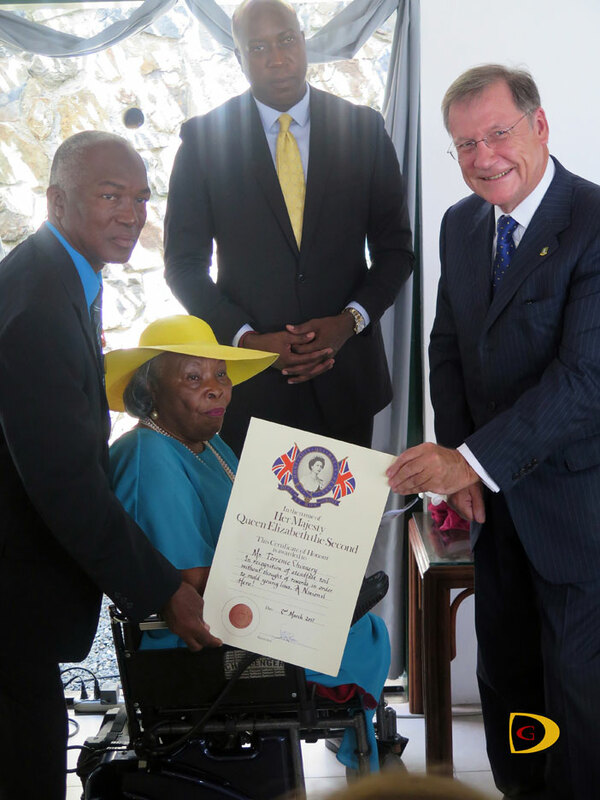 Chinnery was among three persons receiving the honor, including educator Dr. Patricia Turnbull and Rubena Matthias-Fraser of Sea Cows Bay, who has been running a soup kitchen since Hurricane Marilyn in 1995. Chinnery, a Sports Officer with the Department of Youth Affairs and Sports who returned to the territory on the encouragement of Eileene Parsons, has worked on developing young softball and baseball players and at times, funding trips from his personal resources. Getting the honor caught him by surprise. Chinnery said there’re lots of people to thank and it will take him forever to do so. He said he just goes about doing the things he does and not looking for any recognition and just loves what he does. He said when confronted with someone’s dilemma, someone else’s problem, it matters not what happens to you if you get involved rather what happens to them if you do not. “That’s my philosophy when I work with kids,” Chinnery said. “I take them whether they have the ability or not. I don’t turn anybody away because you never know who they might turn out out to be and I never write a kid off, because they can shock you down the road, so you have to stay with thee all the time. Having worked in St. Thomas, St. John and the BVI with young people, some of the persons who stand out he said are Jahrel Cotton, who played for him as a kid and moved to St. Thomas when his mom died and is now in the Major Leagues with the Oakland A’s as a starting pitcher, and he’s an awesome kid. “He came to see me some months ago and said he had to before he returned and it was 10 o’clock at night and I was so surprised,” Chinnery said. He also cited Valissa Bratwaith,e who got a full scholarship and played softball and volleyball for Palm Beach Community College and Volleyball with Western Florida University, and with a week after speaking to a recruiter, she was in school. Chinnery said there are a number of kids he has assisted, some who could have made it to Major League Baseball got injured. “But there are a number of other kids” he said. “Just the fact of being around them, made me who I am today, because I really enjoy them.